Does your web browser recognize ICC profiles? Judging from the stats of people who view my websites only 6.76% of you can say yes. If you're using Internet Explorer, Firefox, Camino, Opera, or Netscape then the answer is a big old stinky NO! So why should you care if your browser recognizes ICC profiles? Because the ICC profile is a little bit of encoding saved with most digital images that tells whatever program that happens to open them exactly how to interpret the colors in that image. Unfortunately this seems to be a pretty low priority for most web browsers and they choose to ignore it. The result is that the images you view on-line probably aren't as they were intended to appear. I've always noticed that my pictures on Flickr had more muted colors and were more drab then when I edited them in Photoshop and that the browsers ignoring the ICC profile was to blame; but there wasn't much to do about it so I just lived with it and bumped up the saturation a little before posting on-line to try and make up for it. Then I found out that the web browser Safari actually recognizes color profiles to I gave it a try. All I can say is that I was amazed by the results; images finally look identical in Photoshop as they do when I view them on-line. Of course this only helps me and not everyone else in the world who views my photos on-line. Safari used to be a Mac only application but the new beta version is supposed to work with Windows XP and Vista as well; though I can't vouch for how well since I'm a Mac guy now. 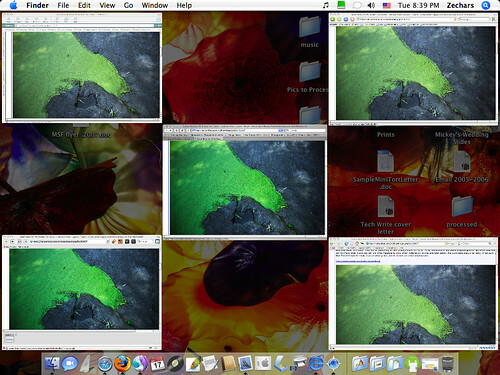 The image to the left was uploaded to Flickr by another user and shows the same image opened in 5 browsers at the same time, comparing the differences in color rendition. Only two of them recorded the same colors that the original author saw when he created the image. It's a pretty eye opening example I think. Unfortunately if you're not looking at the image on a browser that recognizes ICC profiles then it loses some of the impact; but it's still obvious to see the differences. If you click on the image to the left you'll be taken to the Flickr page where each browser is identified by scrolling over the image with the mouse. Anyway, just thought you might want it brought to your attention and I highly recommend you check out Safari to see what you're missing.